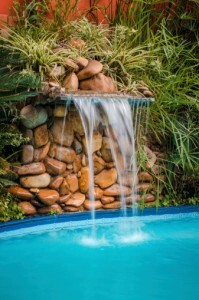 A water fall will add another level of distinction to your pool, and help keep it cool. Waterfalls and water fountains really add something special to a pool. The sound of moving water is therapeutic and makes for a fun spot to swim for the kids. Visually, a water feature can change the entire look of your pool and patio, or help complete your intended design. 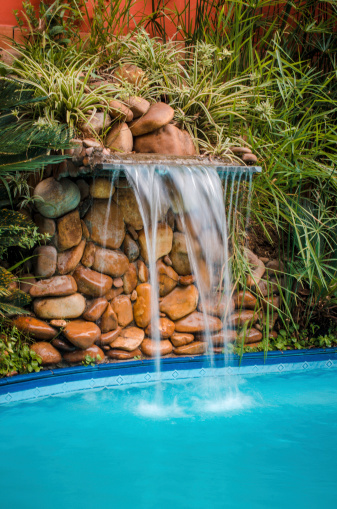 There are many advantages to including a waterfall or water fountain to your pool design, or adding a water feature to your existing pool. Keep reading to learn more! The options for a waterfall are essentially endless. Anything from a natural waterfall to a more modern architectural design can round out your outdoor living design. Water flowing through a garden down a rocky path, or over a blank marble wall will create a talking point for your guests and a focal point in your yard’s design. You could even have a waterfall that doubles as a water slide, that doesn’t look anything like the big plastic chute you’d think it would. If you haven’t noticed, it’s been particularly hot the past few days. The actual temperature hit 100-degrees for the first time since 2012, which can come as a surprise since the heat index regularly tops 100-degrees when you take the extreme humidity into account. But if your pool has a waterfall or water fountain it’s already helping cool off your pool. Thanks to the process of aeration a water feature will help keep the water temperature down by introducing oxygen as it travels through the air. This entry was posted on Friday, July 29th, 2016 at 11:46 am. Both comments and pings are currently closed.